The Start screen’s Internet Explorer app can download files and photos to your Surface, just like its full-sized cousin on the desktop. For example, to download a file from a website, tap the website’s download button. A permission bar appears along the screen’s bottom. Run: Tap this option if you’re downloading a program to install onto your Surface Pro or Surface Pro 2 tablet. The browser downloads the program and then automatically installs it, leaving its icon on the desktop or in the Start screen’s All Apps area. Open: This downloads and opens the item for viewing or installing. Save: This saves the file in your Downloads folder, which is handy when you’re downloading something you want to access later. Cancel: Tapped a Download button by mistake? A well-placed tap on the Cancel button stops the download. To find your downloaded file in the Downloads folder, slide your finger down from the screen’s top edge to open the App bar and then tap the Page tools icon, shown in the margin. When the pop-up menu appears, choose View Downloads to see a list of your downloaded files. 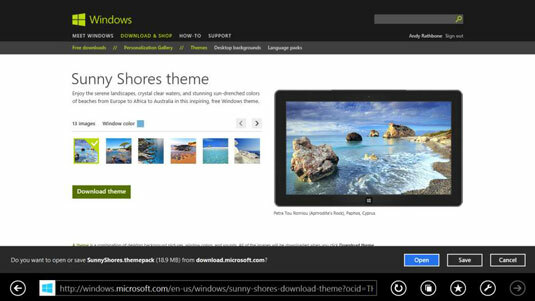 Surface RT and Surface 2 tablets can install only programs downloaded from the Store app. To download a photo, hold your finger down on the photo until the App bar appears along the screen’s bottom. Then tap the Save Picture icon. The App bar vanishes, and the picture appears in the Pictures folder, visible through the Photos app.